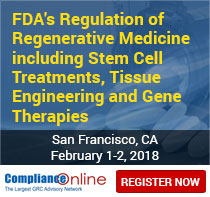 ComplianceOnline, the leading GRC advisory network, and Gwen Wise-Blackman will conduct a two day seminar on FDA's regulation of regenerative medicine including stem cell treatments, tissue engineering and gene therapies. ComplianceOnline, the leading governance, risk and compliance advisory network with over 500 experts in various regulatory subjects, today announced a seminar on FDA's Regulation of Regenerative Medicine including Stem Cell Treatments, Tissue Engineering and Gene Therapies. The two-day seminar led by Gwen Wise-Blackman will be held on February 1 and 2, 2018 in San Francisco, CA. This training workshop will provide a historical context for the use of stem cells in medicine, where the field has been and where it is going. Speaker Gwen Wise-Blackman’s career focus has been in High-Throughput Screening, Cell-Based Assay Method Development and Validation, and Quality Assurance. Gwen has a Bachelor of Science degree in biology from M.I.T and a PhD in Pharmacology from UVa. She is a member of ASQ and AAPS. This two-day workshop will host discussions on fundamentals of stem cells and on how the FDA regulates regenerative treatments and therapies. The various sessions will also address drug and biological approval process, applicable good manufacturing and good laboratory practices, and FDA and other federal agency enforcement action. In addition, the course will provide the various examples of FDA approved use of stem cells in medicine and what is needed for the field to progress.